I used up all of my snapmaker filament. 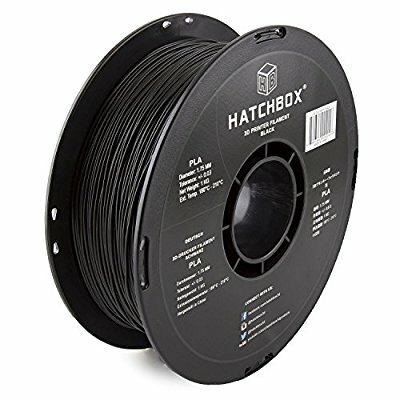 I had some other filament on hand and just ordered another 1kg spool of hatchbox. I did like the characteristics of the snapmaker filament though. When will we be able to purchase more filament from the snapmaker website? Probably not until the kickstarter is fulfilled? I assume you are reselling the filament from another supplier. Are you able to recommend or share more information about the filament you supplied with the printer until I am able to purchase off your website? I want to order the same filament as well… I am down to the last 1/3 spool. I have 3 other spools at home, but just love how the snapmaker filament works. Please let us know when we can order from you, or please let us know where we can order directly till you are ready to focus on filament and other accessories. I too would like to order more Snapmaker filament. I have tried some local stuff from Bilby3D, not very good. I am just testing some from MakerBot and will get some Proto- Pasta soon. Also, I have some samples coming in from www.rigid.ink to try as well. So i actually searched the forums for “filament” because i was not using the one that came with he Snapmaker until now, since my Hatchbox black is nearly out. It worked perfectly right up until it started snagging getting near the end of the roll. I grabbed the filament guide from you Justin (thanks!) and would like to print that, but i can’t get the Snapmaker filament to stick to the bed! I’ve been printing like 24/7 since i got mine last week (burned through basically the whole 1kg roll) and want to continue, but it won’t stick anymore! I’ve calibrated a couple of times and will probably try it again in the morning. I’ve made the the filament is coming through smooth and the nozzle is clean, it just bulbs up as it’s trying to pump out for the first layer. Hopefully I can get this to work and use it up for a bunch of stuff, but so far not impressed with the Snapmaker stuff. I have some 3D Solutech stuff coming next to see how that works, but if that’s no good I’m just gonna stick with Hatchbox. one of my buddies with a different printer has a bunch of their stuff (including glow in the dark and their wood filaments) and all of them have been top notch. I am glad to hear you found the guide useful and have had good luck with hatchbox. I personally didn’t like the quality of the hatchbox filament but I have only tried one spool, maybe it is worth trying a couple more. I am not sure if you have seen by below post. It might help give you some ideas to get your filament to stick again. I assume calibration is the issue, it can be very finicky. I still haven’t mastered calibration. What i think may just need to be done is to clean the bed. I haven’t cleaned it with any alcohol or anything since i put it on and i’ve nearly printed the entire spool. Again the prints came out amazing (i’ll edit this post with a few pics). So i got my answer back from Support for the specs of the thermistor, which luckily I bought the correct ones before they responded. Put together my 3d module, cleaned the bed with a bit of alcohol, and the first print with OK. That print was Justin’s filament guide, which i installed and is working well! Tried several times to kick off my next print. After trying several things, i finally bit it and put painters tape over the snapmaker sticker and it finally stuck. I think here is my issue with the filament that was sent with the unit: it’s too stringy (if that makes sense). Maybe my settings don’t have the retraction high enough (i lowered the speed and increased the distance for the black Hatchbox filament and i’m just using those settings atm). So while my next print (a bunch of tokens for SW:Destiny) is still going, I think i’ll stick to Hatchbox for filament. They have all kinds of stuff that have been tried by other friends, like their wood one and glow in the dark. I have their ABS which i’ll try at some point, but def after printing the internal filament guide! Even when it’s perfectly straight, it’s a paint to get it all the way through! New sticker, recalibrate, and off to the races with ABS (hatchbox of course!). No issues so far just straight out (as it should be!). I will probably just use the filament that came with the maker for connecting larger prints together I suppose but unless i get some smaller nozzles maybe i wouldn’t print with it again. I know you are an Aussie so you might be interested in my experience. I just used a new filament - Black PLA+ from 3D Fillies (https://3dfillies.com/). It seems to stick to the bed better than the Snapmaker supplied PLA. It also seems less brittle. It’s only $22.95 a kilo plus $.8.95 shipping. Ordered on Sun night arrived Tue afternoon. Well done, I did a similar kindergarten learning exercise see CAD Development - Learn and Do. i did not post it to Thingiverse. Thanks for the info, much appreciated. Yesterday I took delivery of more filaments from Bilby3D. some ColorFabb, ProtoPlasta, Flashforge and some more Makerbot and will let you know how they perform. The Makerbot rolls that I acquired previously are quite good; I cannot recommend the Bilby3D branded PLA. I am really keen to hear about your experiences with other filaments. I was thinking about the Bilby stuff but I’ll give it a miss now. I have been doing a bit more printing with the 3D Fillies PLA+ and am finding bed adhesion is excellent. I am using the stock Snapmaker bed with no glue or tape. If I am printing something with a fairly large base I can get away without using a raft or brim. Note that I clean the bed before each print with alcohol. Don’t forget that Bilby3d sell a number of other brands and taht iw here I have source a bunch for testing. I found there own brand too brittle and did not adhere well. i tried changing temperatures however I could not find the corrects setting to use it. While I have been learning I have bought where possible, 200gm rolls. And thanks for the PLA+ info. I shall try that later. Have a great weekend and keep having fun. Thanks Doug. I took the risk and bought a 1kg roll - lucky it worked out! A good weekend to you too. Some of the new rolls I have to test are 1kg because they don’t come in smaller rolls. In using Snapmaker3d and then Cura there was a noticeable difference in quality, Cura was much better. I have been mostly using Cura for slicing. I am still fiddling to get theist results - there are so many variables! Some PET(G) is on my shopping list after I have played with what I have, which will keep me entertained for some months yet. @Doug I’m really keen to hear of your experiences with the rigid ink stuff. You might be on your way to being our Snapmaker fibre reviewer of note! hahahaha, no such notoriety for me. I am just an amateur desperate to learn. I am sure that there are many forum users with knowledge that we all seek… I am just the noisy vocal learner who is journaling his experiences that will hopefully help those other newbies who are not brave enough to ask questions. It is all learning and good fun.